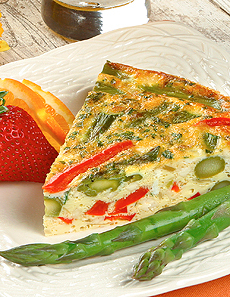 Red peppers and tender green asparagus make this frittata a colorful, delicious start to your day. Photo courtesy California Asparagus Commission. Yes, you can enjoy asparagus for breakfast. In addition to this lovely frittata, you ca serve a side of steamed asparagus with your favorite style of eggs—scrambled, poached or omelet. Make Asparagus Eggs Benedict by adding a few spears on top of the ham, and top off with the poached egg. This is Page 2 of a 12-page article. Jump to the recipe below. Click the black links below to view the other pages. Reserve 6 asparagus spears. Cut remaining asparagus at an angle into 1-inch pieces, reserve. Sauté bell pepper in 2 tablespoons olive oil until soft, but not browned, about 7 minutes. Stir in onion and reserved asparagus pieces; sauté for 1 minute. With a slotted spoon remove vegetables to drain on paper toweling, reserve. Whisk chopped parsley, salt and pepper into beaten eggs. Stir in cheese and reserved sautéed vegetables. Coat the inside of a heavy, non-stick 12-inch frying pan (with a cover) with softened butter. Pour egg mixture into pan. Bake in preheated oven, covered, until eggs are just firm, about 35 minutes. Remove cover; bake until top is lightly browned, about 10 minutes. Loosen the frittata, then cover pan with a large, warmed serving platter. Flip frying pan over onto platter. Cut frittata into 6 wedges; garnish each with 1 reserved asparagus spear. Divide wedges among 6 serving plates, then put a lemon wedge and a sprig of parsley on each plate.